This past week, the developer of the outrageously successful game Flappy Bird took down the app from Google and Apple respective app stores. I’m telling you this in case you missed your chance to download the game. I’ve tried to play this monster timesink of a game to a respectable score, but my high score is five. My average score is probably less than one. But what struck me as I was cursing yet another dead flappy bird was how much the game represents our attempt at navigating social media channels. For those who didn’t have the chance to get the game, the premise is quite simple: you’re a bird, and each time you tap on the screen, its altitude increases. Tap multiple times, and its altitude soars. Stop tapping, and your bird nosedives towards the ground. The object, therefore, is to keep your bird from crashing into the ground. Simple, right? But that’s not the end of it. As the game scrolls, pipes appear from the top and bottom of the screen. Between the pipes is a gap through which you must navigate your bird. 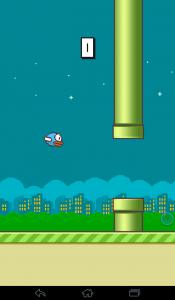 Even the slightest contact with a pipe will cause your bird to drop to the ground. There are no powerups, no pause button, no levels — nothing but you, your finger, and your nerves to keep this little bird in the air. Are you starting to get what I’m saying? Social media channels need your constant attention and promotion. Stop ‘tapping’ them and awareness in your brand sinks like a stone. Tap too much or too little, you’re going to run smack into an obstacle, and that will sink you just as fast. You have to delicately find the sweet spot that engages your audience without being too much or too little. Once you find it and pass that hurdle, you’re on to the next item/article/campaign you’re promoting. What just happened isn’t relevant anymore; you’re already facing your next challenge. When planning your social media marketing strategy, don’t assume that making a big splash will help you maintain your engagement. It’s the careful, stay-on-target, constant fine-tuning approach that will get you through the social media hurdles and increase your engagement ‘score’ with your audience. Of course you can walk away for the game for a little while. But don’t have the expectation that your audience will be there when you come back.